Coordination of Benefits (COB) refers to the set of rules that determines responsibility for payment among all health plans that cover an individual. You must keep the Plan informed about all other health coverage that you have or are eligible to receive, so that the plans can properly coordinate your benefits. The Plan coordinates benefits with all other group and private health plans, as well as Medicare. The Plan also coordinates benefits for married couples who are both eligible for coverage as Participants in the Plan and for the Dependent children of two eligible married Participants. If a parent and a child are both Participants, the Plan will coordinate benefits with respect to the child’s coverage. However, since under Plan rules the parent cannot be a Dependent of the child, the parent will only be treated as a Participant and will only have his or her own coverage. If you qualify for coverage with the Plan and another health plan, it is important that you understand the impact of choosing whether or not to pay the premium for either the Plan or the other plan(s). COB rules can be difficult to understand. Therefore, we strongly recommend you contact the Plan to discuss your individual situation when deciding whether or not to pay a premium for coverage. You should also contact your other plan(s), as plans have different rules for coordinating benefits. When coordinating benefits with Medicare, the Plan also uses active and inactive coverage rules. Whichever plan is designated as the primary plan pays first on your Claims. If a balance is still due after the primary plan’s payment, the Claim should be sent to the secondary plan for consideration (and, if applicable, a third plan and so on). In determining which of the plans is primary or secondary (or third), the Plan will apply the rules outlined below. The first rule that applies to your specific situation will be followed. The plan without a COB provision is always primary. The plan that covers a person as a participant is primary to any plan covering the person as a dependent. The plan that covers a person with Earned Eligibility or as an active employee is primary to any plan covering the person as a retiree or any plan providing self-paid coverage, such as COBRA Continuation Coverage. If a person has the same type of eligibility (for example, Earned Eligibility) with more than one plan, the plan covering the person for the longest continuous period is primary to any plan(s) that has covered the person for a shorter period. If you have the same coverage effective date under more than one plan, please contact the Plan for help determining how your benefits should be coordinated. In the case of a dependent child where the parents are not divorced, the Plan uses the “birthday rule.” This means the plan of the parent whose birthday occurs earlier in the calendar year is primary. If both parents have the same birthday, the plan that has covered the child the longest is primary. If the other plan does not have the birthday rule, then the other plan’s rules will determine who is primary. If the parent with custody has not remarried, the plan of the parent with custody is primary to the plan of the non-custodial parent. If the parent with custody has remarried, the plan of the custodial parent is primary, the plan of the custodial parent’s spouse is secondary and the plan of the non-custodial parent is third. If a court order provides a different order of benefit determination, the court order will be followed. A copy of the court order will be required. While we have done our best to provide an explanation, the Plan’s Entertainment Industry Coordination of Benefits (EICOB) rules can be difficult to understand. We strongly suggest you contact the Plan to discuss your individual situation. If you are entitled to primary coverage with another entertainment industry plan but fail to pay the premium in that plan, the SAG-AFTRA Health Plan will maintain its secondary position. The Plan refers to this as the Entertainment Industry Coordination of Benefits (EICOB) rule. This rule was incorporated to maintain the correct primary and secondary positions of the health plans based on your longest continuous coverage. Other entertainment industry plans subject to the EICOB rule include the Directors Guild of America-Producer Health Plan, the Equity-League Health Plan, the Motion Picture Industry Health Plan and the Writers’ Guild-Industry Health Fund. These rules apply to Participants and Dependents in both Plan I and Plan II, regardless of whether you have Earned Eligibility or you are eligible for Senior Performers or Surviving Dependent coverage. If you do not enroll in your primary coverage, the Plan will maintain its secondary position by only paying up to 20% of the Allowed Amount for your Hospital and medical Claims, including mental health and substance abuse Claims, subject to the Deductibles. For prescription drug benefits, you will not receive an Express Scripts ID card. You must pay for your prescriptions at the pharmacy and submit a Claim to the Plan for reimbursement of up to 20% of the Allowed Amount, subject to the out-of-network medical Deductible. Dental and vision benefits will continue to be administered through Delta Dental and Vision Service Plan as if the Plan is primary. Same longest continuous coverage date – When the longest continuous coverage date, as described above, is the same under the Plan and your other plan, you are referred to as a “pro rata” Participant. This means that you will be able to choose the plan you wish to be primary. Only Participants in this situation are given a choice of which plan they wish to be primary. If you think you may be a pro rata Participant, please contact the Plan. Primary plan offers only individual coverage – If your primary plan only offers individual coverage and excludes coverage for your Dependents, the Plan will continue to pay primary for your Dependents. For example, the Equity-League Health Plan provides individual coverage and requires Participants to pay the full cost of coverage for their Dependents. If your primary coverage is Equity-League, your Dependents would continue to be covered as primary in the SAG-AFTRA Health Plan, regardless of whether you continued the other coverage. However, if the other plan does provide Dependent coverage, you will be required to keep your Dependent coverage in the other plan to avoid a reduction in your benefits from the Plan. Deferral of Equity-League Health Plan eligibility – The Equity-League Health Plan has a rule that gives its participants the choice to defer their health coverage in order to gain a longer period of eligibility for coverage. If your other primary plan is the Equity-League Health Plan and you choose to defer your Equity-League eligibility in accordance with that plan’s rules, the Plan will not apply its special EICOB rule. This means the Plan will pay as primary for those participants during the deferral period. However, if you drop your Equity-League coverage for any reason other than the special deferral rule (such as for non-payment of premiums), the Plan will reduce its benefits accordingly. The Plan’s original position is third or lower – If the Plan’s original position is third or lower, the reduction does not apply, provided you pay for your primary or secondary coverage. For example, if you have DGA coverage as primary, Equity-League coverage as secondary and Plan coverage as third – but you fail to pay your Equity-League premium – the Plan will pay as if it were in second position. Your benefits will not be reduced because of your failure to pay the Equity-League premium. However, if you fail to pay both your DGA and Equity-League premiums, the Plan will reduce its benefits. If Medicare is your primary plan, this exception changes so that the reduction does not apply if the Plan’s original position is fourth or lower. For example, if Medicare is primary, Equity-League is second and the Plan is third – and you fail to pay the Equity-League premium – the Plan will only pay what it would have paid in the third position. Married Participants both eligible for Plan coverage – A special rule applies to married Participants who are both eligible for Plan coverage and who also have coverage in another entertainment industry plan. If the Plan is primary for one or both of the Participants, the Plan will not reduce benefits if the Participant and/or the spouse of the Participant does not elect to enroll in the other entertainment plan coverage. You may choose to pay for only one SAG-AFTRA Health Plan coverage, which will cover you and your Dependents as primary coverage. If you pay the premiums for both SAG-AFTRA Health Plan coverages, the Plan will coordinate benefits between both coverages. Parent and Dependent child both eligible for Plan coverage – The special rule just described also applies to families where a parent and Dependent child are both eligible for the Plan. If you or your Dependents have primary coverage with an HMO (including a Medicare HMO), you must use Providers in the HMO’s Provider network. When you do, the Plan will pay secondary for any Copays or Deductibles you may incur. If you do not use HMO network Providers, the Plan will reduce its benefits by 80%. In other words, the maximum the Plan will pay is 20% of the Allowed Amount for the Claim. It is extremely important that you use your HMO network Providers when the HMO is your primary plan. If you do not, your benefits under this Plan will be reduced and you will have much larger out-of-pocket expenses. In cases where your HMO excludes specific services that this Plan covers, such as chiropractic care, regular Plan benefits will be paid. Once a determination has been made about which plan is primary, the benefits are processed as follows. If this Plan is primary, bills should be submitted as outlined under “How to File a Claim.” This Plan will pay benefits based on its rules as if there were no other coverage. If this Plan is secondary, copies of the original bills and a copy of the other plan’s EOBs should be submitted as outlined under “How to File a Claim.” However, if this Plan is secondary because Medicare is your primary coverage, you do not need to send your bills and EOBs to the Plan. Medicare will submit this information on your behalf. The Plan will determine how much it would have paid had there been no other coverage. It will then subtract what was paid by the primary plan from the total COB allowable expenses. The COB allowable expenses are based on whether or not the Provider is an In-network Provider. The difference between the COB allowable expenses and what the primary plan paid will be paid by the Plan, provided it does not exceed the amount the Plan would have paid if it was primary. When a BlueCard PPO or Beacon Health In-network Provider is used, if the primary plan has already reimbursed more than the network Contract Rate, the Plan will not make any payment, and the remaining charges become a network write-off. You are not responsible for the balance. To better understand how this works, refer to the examples outlined below. Both examples assume that the Participant is enrolled with Plan I coverage, is using an Out-of-network Provider and that the Deductibles have been met. If you are age 65 or older and you have COBRA, Senior Performers or Surviving Dependent coverage, Medicare provides primary coverage and the Plan provides secondary coverage. With regard to Earned Eligibility, federal law requires that this Plan be primary to Medicare for active Participants who are age 65 or older. The rules in the table below should be applied to determine whether or not you have Earned Active Eligibility or Earned Inactive Eligibility. *The AFTRA Health Fund considered a Participant who satisfied the earnings requirement entirely through residual earnings to have active eligibility. If you had AFTRA active eligibility based on residuals as of December 31, 2016, your active eligibility will continue in the SAG-AFTRA Health Plan through the end of your Benefit Period. Thereafter, the Plan will evaluate your active and inactive status based on the rules outlined in the table. It is possible for your status to change from year to year. For example, if you have Senior Performers coverage and satisfy the minimum Covered Earnings requirement through a combination of residual and sessional earnings, you regain Earned Active Eligibility and the Plan becomes your primary plan. In the next year, if you only have residual earnings, you change back to Senior Performers coverage and Medicare would become your primary plan. Senior Performers and Surviving Dependents cannot gain Earned Inactive Eligibility. If the minimum Covered Earnings requirement is satisfied solely through residuals, these individuals keep their Senior Performers or Surviving Dependent eligibility. The Plan will notify you of any change in your eligibility and can tell you which plan is primary at any time. The following special rules apply to any Participant or Dependent who is eligible for Medicare, including Participants or Dependents age 65 or older and Participants or Dependents who are eligible for Medicare due to a disability. The distinction between sessional and residual earnings is made only for purposes of COB with Medicare. If you satisfy the minimum earnings requirement through residuals only, you will have inactive coverage and Medicare will be primary. Medicare is primary for Medicare-disabled Dependents of Participants younger than age 65 whose Earned Eligibility is based on residuals only. Special rules apply to individuals with End Stage Renal Disease. Contact the Plan for details or refer to the Medicare & You handbook available at www.medicare.gov. If you or your Dependents qualify for other health coverage in addition to the Plan and Medicare, please contact the Plan to determine the order of Claims payment. The Plan’s Entertainment Industry Coordination of Benefits (EICOB) rules will apply in this situation and can be difficult to understand. The Medicare COB method described in this section applies to all Participants and Dependents with Medicare except those that received Senior Performers or Surviving Dependent benefits under the Screen Actors Guild–Producers Health Plan prior to January 1, 2017. For those Medicare COB rules, see below. Medicare pays its benefit allowances first for Hospital or medical services that you receive and the Plan pays its benefits second based on the Plan’s in-network reimbursement provisions. Before the Plan begins to pay a benefit, you must satisfy the annual in-network Hospital and medical Deductibles. Upon receipt of your Claim, the Plan will subtract what Medicare paid from the Medicare allowance and then deduct any outstanding annual Deductible amounts you may owe (based on your annual in-network Hospital Deductible and your annual in-network medical Deductible). After your outstanding Deductible amounts have been subtracted, the Plan will apply the in-network Copays and Coinsurance amounts as applicable. The total benefit paid by Medicare and the Plan will generally cover less than 100% of the Medicare allowance. Participants usually will have an out-ofpocket expense, regardless of whether or not they have satisfied the Plan’s in-network Deductibles. To better understand how this works, refer to the examples outlined below. 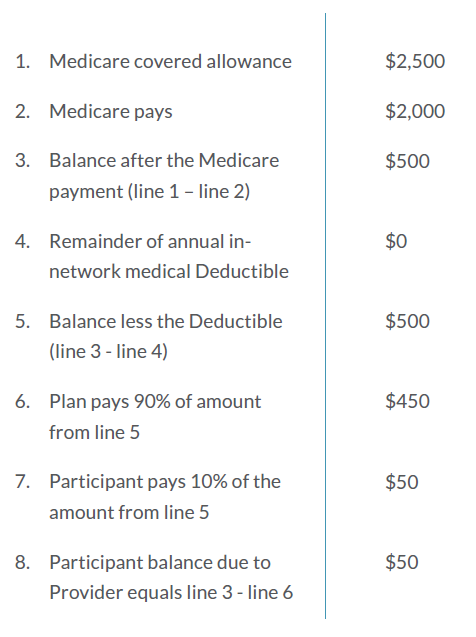 In this example the Participant has satisfied the Plan I annual in-network medical Deductible of $250. All of the other assumptions are the same used in the previous example. The Plan will calculate its benefits as if you had received benefits from Medicare even in the following situations. You fail to enroll in Medicare Parts A and B when the Plan is secondary to Medicare. You should contact Medicare at least three months before you turn age 65 to enroll in Medicare. You use a doctor who has opted out of Medicare. Medicare allows doctors the opportunity to opt out of the Medicare system and contract directly with patients to provide treatment that will not be covered by Medicare. A doctor who has opted out of Medicare must inform the patient that Medicare will not cover his or her services. Additionally, the doctor and patient must sign a written contract in which the patient agrees that the doctor’s charges will not be paid by Medicare. If you or your spouse use the services of a doctor who has opted out of Medicare when Medicare is your primary coverage, the Plan will pay only what it would have paid if you had chosen a Provider who does accept Medicare. You fail to use a Medicare HMO Provider when Medicare is primary. Medicare beneficiaries have a choice between traditional Medicare (Parts A and B) or a Medicare HMO (Part C). 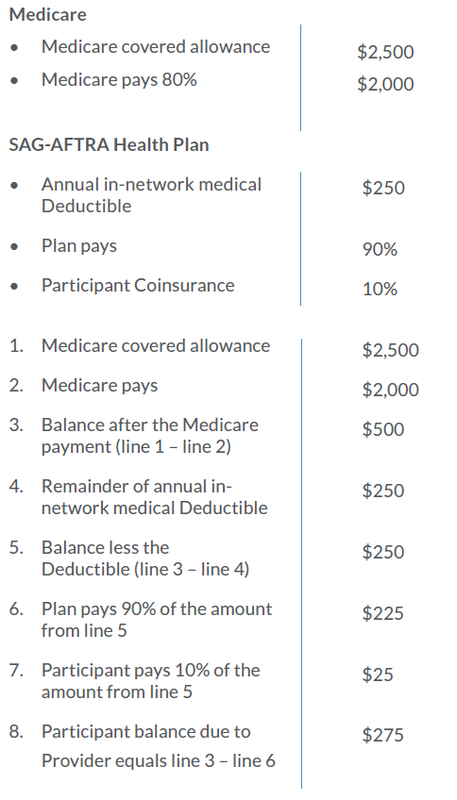 If you or your spouse are enrolled in a Medicare HMO as your primary plan, but you do not use HMO network Providers, the Plan will pay only what it would have paid if you had used the HMO network Providers. If you received Senior Performers or Surviving Dependent benefits under the Screen Actors Guild–Producers Health Plan prior to January 1, 2017, the SAG-AFTRA Health Plan will coordinate benefits with Medicare using the method described under “When the SAG-AFTRA Health Plan Is Secondary.” However, the Plan will reduce benefits by 80% for Medicare beneficiaries under the three situations described above. This is because the Plan will pay Claims only on a secondary basis, as if you received primary reimbursement from Medicare.